On a cool, cloudy and misty spring morning I walked the length of the Vietnam Veterans War Memorial in Washington D.C. My seven year old daughter accompanied me on the solemn, slow stroll. 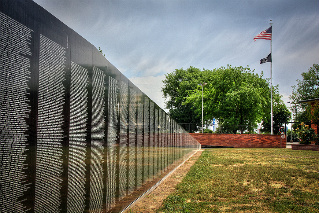 The wall, inscribed with 50,000 names of soldiers killed in the war and listed in chronological order, increases in height until you reach the midpoint and then the wall begins a gradual descent. The architect, Maya Lin, was criticized by many when her memorial was first created. But time and her simple design have helped to heal many. I found the experience of traversing the distance of the wall to be very moving. The enormity of life lost and the sacrifices made by so many filled my eyes with tears. I knew my daughter didn’t really understand what we were visiting, but she sensed the significance. War is not glorious, but certainly we must remember and pay tribute to those who’ve served our country, especially those who have made the ultimate sacrifice. That is what Memorial Day is about. There are many war memorials in the United States. A few, such as the Vietnam Wall, are in Washington D.C. On the National Mall you can find the World War II Memorial and the Korean War Veterans Memorial. In New Mexico where I live there is a Memorial Park in Albuquerque and also a very impressive Vietnam Vets Memorial and Chapel in Angel Fire. A story on CBS Sunday Morning related the experience of John Colone, a Vietnam Vet who was shot four times in 1968. Everyone in his unit believed he was dead. They put him in a body bag and sent him to the morgue. Lucky for him, a very attentive attendant, Lt. Curtis Washington, had the habit of checking each soldier. He would take a pen to the feet and swipe it along the bottom, a reflex check. When he did it to Colone he heard an audible gasp. And he realized the man was alive. In essence, he brought him back from the dead! John Colone doesn’t take his second chance for granted. For years he has spent a great deal of his own money each Memorial Day to have fresh flowers placed on the graves of Vietnam Veterans. He started with the men from his unit, but eventually began to include more, over 100 others. He has often questioned why he lived when so many others died. His annual act of honoring fallen soldiers is his way of showing appreciation for his fellow comrades in arms. And he hopes others will follow his lead and adopt a veteran on Memorial Day. He simply asks that you would clean their grave site and place some fresh flowers. It is a simple, yet fitting tribute. Why build a web site when you can build a business? Site Build It! is absolutely the best way to build an online business. Click the link below to discover the many benefits.